Shift your practice into a new space at Drama SA’s 2018 State Conference - highlighting some of the best South Australian arts practice on offer. A huge thank you to everyone who attended on the 11th of August. You all made it such an enjoyable event. Another big thank you to all of our amazing presenters and of coaurse to Finegan Kruckemeyer for his inspirational keynote speech. We look forward to shareing more events with you in the coming year. Finegan has had 85 commissioned plays performed on five continents and translated into six languages. His work has enjoyed seasons in 200 international festivals and at the Sydney Opera House (six works), DC’s Kennedy Center (three works), NY’s Lincoln Center (three works), Dublin’s Abbey Theatre and Shanghai’s Malan Flower Theatre. He and his work have received 36 awards over the past 13 years, including the 2017 Mickey Miners Lifetime Achievement Award for services to international Theatre for Young Audiences, 2015 David Williamson Prize for Excellence in Australian Playwrighting, six Australian Writers Guild Awards and an inaugural Sidney Myer Fellowship. He has spoken at conferences in nine countries, with papers published and works studied at international universities. They begin as an outline. Then features form, histories are built, futures invented. From these first silhouettes, characters will come to life and finally, the world which might hold them. Replicating techniques taught to thousands in schools, universities and writing groups worldwide, build the beginnings of a play from the protagonist out. “I laughed so much I couldn’t believe I was working”, will be the first thing you think, then you realise you’ve actually learnt so much! Whether you are new to teaching drama or want to invigorate your bag of tricks, this workshop will show different ways to develop performance and improvisation skills in a step-by-step positive, confidence-building and entertaining way. Inspire your students and yourself! (Just don’t tell anyone back at school you had so much fun). Founder of ImproNOW, Anne Mayer has trained in Canada with Keith Johnstone (creator of TheatreSports™) and in Sydney with Lyn Pierce (author of TheatreSports Down Under) and has nearly 20 years’ experience teaching and performing improvisation, acting and clowning. ActNow Theatre creates interactive storytelling projects with a range of communities. 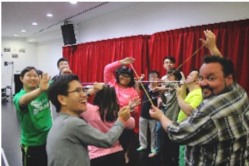 The workshop will explore basic approaches to theatre and games that can be used in Drama classrooms and in other subject areas. A focus of the workshop will be Image Theatre, originally developed by Augusto Boal as part of his 'Theatre of The Oppressed', and an outline of Forum Theatre - an activist focused technique for audiences to "rehearse for the revolution" and develop their own approaches to deal with issues of oppression. Alirio Zavarce will share his methodology and approaches for inclusion for effective community engagement tailored to the skills, needs and abilities of students with or without disabilities. This is a practical theatre workshop that will allow you to experience processes for the creation of equal arts access & inclusive participation. State Theatre Company Artistic Director will take participants through the basic building blocks of rehearsing a scene, providing tools with which to approach the staging of texts of any style. As part of the session Geordie will share elements of his own directorial process and the influences which have contributed to it. By connecting the voice to breath, body, and clear imagery, the actor is capable of producing a vocal quality that resonates with truth and nuance. Based on the techniques of Kristin Linklater, this workshop introduces the concept of ‘freeing’ the voice of the Drama student, whilst instilling safe vocal practices. A range of warm-up techniques will be explored, moving into text-based applications that can aid character development and the rehearsal process. Jacqueline Cook originally trained in Linklater at AC Arts, Adelaide, and for the past 20 years, has continued to be inspired by the method, utilising it as both a professional actor and Drama teacher. Valerie Harrold provides a session that is playful, encouraging and full of hands-on practical ideas that can be easily implemented in the pre-school, classroom and home setting, unlocking the storyteller within us all. Valerie has specialised in Drama, Music and Performing Arts, teaching and performing from pre-school to tertiary students, and has over 40 years’ experience working in Category 2 schools engaging disadvantage students with their learning, through Drama. Valerie is a member of Drama SA and is currently the DALO (Drama Australia Liaison Officer). Ruth has been studying Martial Arts and Acting for almost 15 years and has achieved diplomas in both. Ruth’s workshop will explore the concepts and ideas behind stage and screen action/combat, specifically targeted towards acting and drama students. It will involve basic co-ordination, safety, team and partner work, and some of the considerations taken into account when choreographing fight and action scenes for actors. It will be interactive and fun, with a chance to ask questions and discuss concept and ideas. If your eyes glaze over when you read the ACARA descriptors for Junior Drama, then this workshop is for you. Let me, help you make sense, of the Elements of Drama that the ACARA boffins expect our students to develop in collaboration with others. In this workshop you will learn how to develop students’ skills in; voice, movement and actors’ focus, ways to create tension, use of space, time, language, and symbol, in creating focal points for an effective performance for an audience. This workshop will be a practical one, with some theory. Joanne Budrys studied Drama at Adelaide University and she gained a Post Grad Dip Ed in Drama, under the tutelage of John Murphy, at Sydney University. As a teacher Joanne has taught across 3 different states and 3 different systems. She has also been selected as a judge in a NSW Shakespeare festival and she has had students participate in Under the Big Top, in regional NSW. Her philosophy of Drama was initially inspired by the work of Dorothy Heathcote and 28 years later, she still believes, that for students, the process is more important than the product. Trent Phillips is an early careers teacher of The Arts, specialising in Drama. I also identify as a technologist with a keen interest in consumer electronics and how they can be incorporated into the learning environment. The devices we have in our pockets, laying on our couches at home and locked away in computer rooms have so much more potential than selfies, Netflix and numeracy apps. I have worked with students using mobile devices to film and edit movies. Sample and record their own singles and explored the possibilities of 360 cameras and how they can be used to create and enhance new Drama. Currently I am working with classroom teachers to integrate a Chromakey and media lab into their curriculum. Recently designed and constructed to be student focused and operated, the students are in control of its potential. 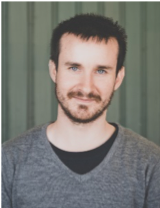 Matthew Maloney is a Pre-Service Teacher specialising in Drama with a passion from technology and the ways to integrate consumer and technology into the classroom and curriculum. The technology around us has far more potential than calculators and word processing. I have worked with students to create videos using mobile devices and dedicated cameras, recorded and filmed Drama and Music performances and integrated Green Screen videos into live performance and recorded videos. Currently I am working with Stage 2 Drama students to create their Group Devised performances, as well as, their Group Performance. Belinda MacGill is a lecturer, artist and researcher at University of South Australia. Belinda won several teaching awards including the Student Choice Excellent Teacher Award (UniSA), Citation for Outstanding Contributions to Student Teaching (National award) and Excellence in Teaching Award (Flinders University). Her primary research interests draw on the fields of Indigenous education, postcolonial theory, visual methodologies, arts pedagogy (Dawson 2013) and critical race theory. Her theoretical work is informed by Indigenous knowledge’s (Nakata, 2004; Smith 1999), Giroux’s border pedagogy (1995), and place based pedagogy (Carter, 2009; Somerville, 2011). She has published in a broad range of articles concerned with postcolonial receptivity, teaching in the contact zone, critical pedagogy and feminist art theory. This practical workshop employs an eclectic collection of useful techniques and tools to explore Realism with secondary Drama students. Using excerpts from Arthur Miller's play text, 'Broken Glass', conventions including internal dialogue, motivation and authentic use of gesture, movement and voice will be unpacked and practically applied to the text that can easily translate to the Drama classroom. 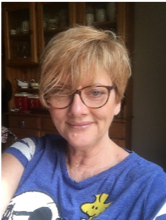 Melissa Newton-Turner is a passionate and highly experienced Drama teacher and education consultant who has worked in early childhood to tertiary Arts education for over 25 years. Having moved from Brisbane late last year where she was Head of Faculty - The Arts at St Rita’s College and Queensland Ballet’s acting coach, she has recently worked as workshop creator and presenter for Windmill Theatre Company. Author of the very successful resource, ‘Outside the Square’ and co-publisher of Sue Rider’s play, ‘The Pink Twins’, Melissa has presented at state, national and international conferences. She has also served as board member for Zen Zen Zo Physical Theatre Company and was Dramaturg for choreographer, Joseph Stewart’s, Sweet Meniscus at part of Brisbane’s 2014 Anywhere Theatre Festival. Sally is an AWGIE award winning playwright for children and young adult audiences and is the South Australian Chair of the Australian Writers Guild. She has worked with the likes of Patch Theatre Company, Brink Productions and the True North Youth Theatre Ensemble, and is director of her own company Free Range Theatrix. In this workshop Sally will focus on working with young actors to find/create characters and stories that relate to (or don’t stray too far from) their own realm of experience, thus enabling their best possible – or at least most truthful – performances. Drawing in particular from her experience writing Gone Viral (commissioned by OLSH College and winner of the Trinity College London International Playwriting Award), and Unravelled, Sally will help you to see how your students’ own life experience can inform and even shape the plays which they perform, and how working with a writer can facilitate this process. Puppets can be wonderful tools for learning and self-expression; however to maximise their benefits, students and young children need to be taught how to use them. Puppet play stimulates learning. When students and young children are introduced to the art of glove puppetry, they have at their disposal a useful tool for expression. Workshop links to oral storytelling and aural literacy; and will explore ways to use puppetry for protective behaviours. Sue Harris has been performing professionally and teaching puppetry since 1978 and is recognised as one of SA’s leading Puppeteers. Her experience is vast, ranging from Education, television, prisons, theatre, festivals, collaborations with Orchestral and Opera projects, to street theatre and many more. She has judged puppetry and theatre for Adelaide Fringe Festival; mentored; and often works in the area of social justice. Sue has authored a teaching resource for puppetry; contributed to international industry publications on Community Theatre and Puppetry. She is a trainer for Child Safe Environments.